Advanced analytics is increasingly used as a complement to traditional BI analysis in many organizations. As companies gain in experience, they are moving away from experimentation and on to facing the challenge of how advanced analytics can be productively used as a value-adding success factor in the business, and also how it can be broadly implemented. This report focuses on vendors offering advanced analytics and data mining platforms, and analyzes the strengths and challenges of all the leading vendors in the market as well as a number of smaller vendors that often have less visibility, but equally offer outstanding value to their customers. 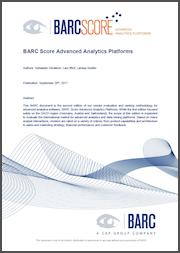 “BARC Score Advanced Analytics Platforms” is available to all BARC Access customers, or can be purchased individually. There are specific inclusion criteria for vendors to be listed in this BARC Score: the first is associated with the characteristics of the vendor’s product, the second is linked to the financial results and installed user base of those products and the third refers to the regional distribution and support of the software. It must offer algorithms in the areas of unsupervised learning, supervised learning and time series analysis. The software must offer the ability to specify custom workflows. The software must support the entire analytical cycle (data preparation, modeling, model evaluation and operationalization). A user interface for model development must be provided. In addition, the vendor has to generate a minimum of 1 million EUR in license revenue per year with the above product set, spread across two regions of the world. In order to include vendors with an open source business model that have also gained popularity in commercial applications, we included software that has an installed user base of at least 10,000 users. 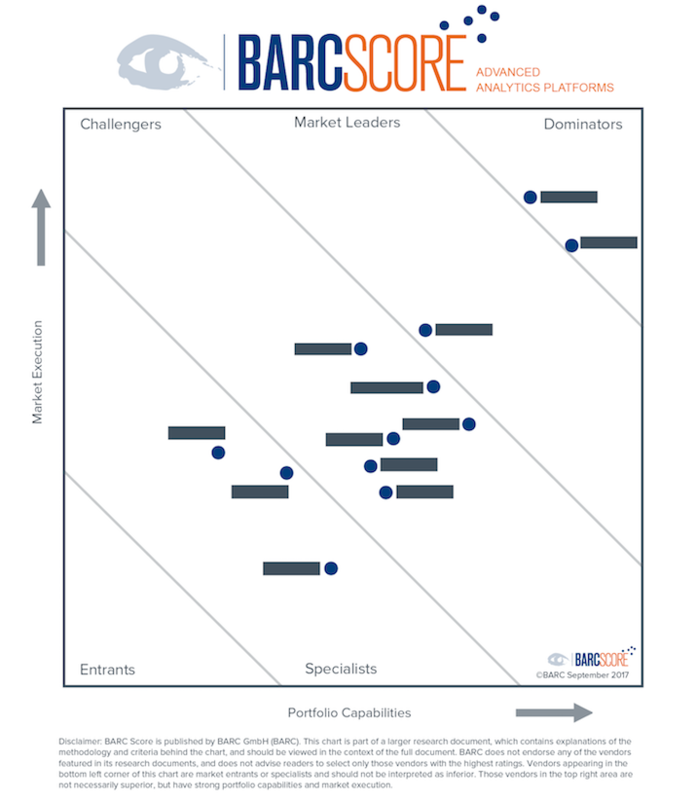 Every vendor is evaluated on two dimensions, ‘Portfolio Capabilities’ and ‘Market Execution’, each representing one axis on the BARC Score chart. Click here to find out more about the BARC Score methodology.